There was a comment on my Facebook Page regarding the low carb bagels we’ve been discussing, referring to “fake bagels” vs “store bought bagels”. I thought we should address that, in case you have questions about the comparison & ingredients and such. 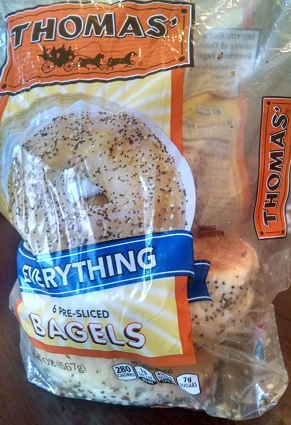 I happened to have a bag of Thomas “Everything Bagels” in the house recently, as I had a house guest that ate those. 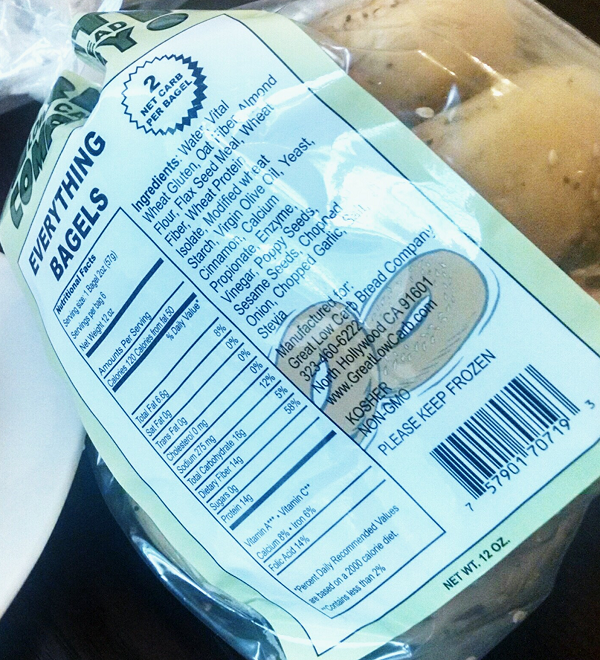 I was actually surprised to see Stevia on the list of ingredients for the Everything Bagels. I certainly don’t taste anything sweet, or any “stevia aftertaste” in those like I do the Cinnamon Bagels from The Great Low Carb Bread Company – so it must be a VERY slight amount, being the last ingredient listed. I did not like the Cinnamon Bagels, by the way – but some other people really did. It boils down to a Stevia preference it seems. You can read the discussion here on that. Overall, I’m extremely impressed with The Great Low Carb Bread Company AND their products. I’ll definitely continue ordering the Everything Bagels, and look forward to trying the other low carb breads they offer! p.s. Thoughts?? Leave a comment! I love the Thomas brand everything bagels! One of the foods I miss most. I’m glad that you shared this debate topic! I ordered my first purchase of the great bread company’s everything bagel and I can’t wait for them to get here! I can’t say anything about the taste since I haven’t had them yet but I will say that the ingredients in the great bread company’s bagels are a lot more appealing to me than the Thomas brand bagels ingredients. I would say that Thomas bagels are the real “Fake” in this debate. I was surprised too, when I really sat down and compared the labels. 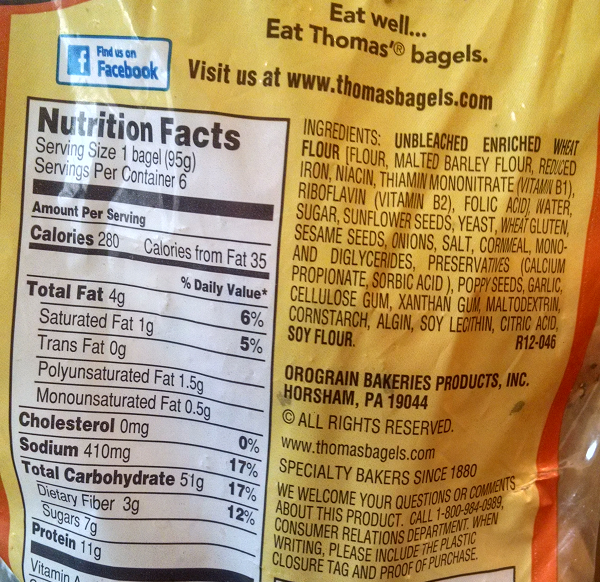 And especially that the low carb bagels are non-GMO, and Thomas Bagels are not. Interesting. Lynn, have you tried the hamburger rolls ? The hamburger Rolls are more the consistency of eating a pretzel bun, However… WORTH it to eat an actual real cheeseburger. Heck, even great to drag along to get a fast food burger and switch the buns. I prefer them grilled or toasted, the crunch mask the slightly chewy pretzle bun texture. I have!!! I can’t say that I love then “as is” because they have a chewy texture. If you toast or grill them, they are really good! They freeze well and thaw fast! Sometimes, I cut them in half and butter the insides then grill them with the insides down on the skillet and make tuna melts. I stick to 20 net carbs per day as my max/limit. That’s Total Carbs minus Fiber and allows me to eat plenty of fresh greens – which is where I get the majority of my carbs. You can only get these low carb bagels online, and the cheapest place to get them is here: http://www.netrition.com/cgi/goto.cgi?gid=8260&aid=3558 They are definitely the best! The best foods to eat on a low carb diet are just “Meat & Greens + Healthy Fats” – that’s the best rule to go by. Try to keep it simple, not a lot of complicated recipes. I love the bagels, but the bread, hot dog buns and hamburger buns, not so much . They are gummy tasting to me. Only like them if toasted. I totally agree!! The everything bread is really good though! Very soft and great flavor! I make grilled tuna melts and turkey Swiss sandwiches with it. I even take it to restaurants and have them use it for toast and sandwiches. I am getting together an order from Netrition. What are some of the things you really like to use from this company? I see bagels and buns. Just want to know before I order. I have a list here: http://www.travelinglowcarb.com/5620/low-carb-foods-at-netrition/ I really like the Mountain Berry Preserves on that list, and the Almond Meal I use quite a bit too. The low carb tortillas are good too. Guys bbq sauce is pretty good. I Doctor it up with Frank’s red hot, seasonings and just a pinch of Splenda. It’s a good base if you miss bbq meals. Have any of you compared these to the ThinSlim Foods Love the Taste Everything bagels? Hi! I am doing low carb 20 net carbs per day. I have ordered the sliced bread & pizza crust from that company. Not bad but expensive. I actually started to wonder if the ingredients in these products are ok to eat when doing the induction phase? I don’t do phases or programs, I keep it simple: 20 net carbs max, 70% fat minimum. That’s basically “induction phase” numbers, but it’s the definition of a ketogenic diet also. I love everything I’ve seen so far and have already ordered several of the products from netrition. Can’t wait to try them. Recently had a heart attack and absolutely NEED to be low carb, so THANK YOU for all the ideas and recipes. I am surprised to see you use Splenda in ANY way! Pure poison! Why not xylitol ? I don’t actually use Splenda anymore. I wrote this almost 3 years ago. I still use and love the products from Netrition though – and the low carb Everything Bread and Everything Bagels remain a favorite! I’m so sorry to hear you went through a heart attack recently. What a scare! A healthy low carb lifestyle is a great choice. I assume your doctor recommended that for you?